After the bogus, wacked, and 'weak' apology from the NY Post it seems that a whole bunch of black folks are still pissed off with the NY Post Political Cartoon even after the apology. Let's place Gov. Paterson, Michelle Malkin, and Alan Keyes, into the same sinking boat. 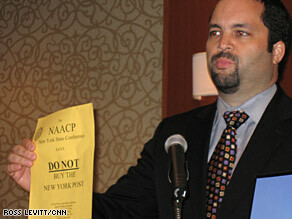 Now the 'old-school" civil rights organization, the NAACP is getting involved. After making a weak statement regarding the NY Post. AAPP: Now the national NAACP has decided to step up the conversation. CNN and other news outlets are reporting that leaders of the NAACP on Saturday called for the firing of the New York Post cartoonist whose drawing lampooning the federal stimulus bill has drawn charges that it's racist and encourages violence toward President Obama. AAPP: I'm so glad that people in organizations like the Color of Change are around. You see, The Color of Change, didn't have to place the finger up in the wind to test and see which way the winds of change were blowing on this issue. You see, they took the lead, and decided to Tell The New York Post: This isn't funny. They asked people to join them in demanding that The Post apologize publicly and fire the editor who allowed this cartoon to go to print. They demanded accountability! Hopefully the NAACP will move to become more active in internet activism. It is said that they have over 400,000 email addresses of members. Maybe, at some point the NAACP, Lawyers Committee on Civil Rights, Color of Change, The Poor Peoples Campaign, CORE, SNCC, the Action Network, The Rainbow Coalition, the Afrospear and other civil rights/human rights activist groups can come together and lead by example. American Financial Collapse = Russia = National Emergency Centers? First George Soros Buys The Home Depot Inc., Union Pacific Corp., RR Then as reported by Reuters - the renowned investor George Soros said on Friday the world financial system has effectively disintegrated, adding that there is yet no prospect of a near-term resolution to the crisis. AAPP: We probably should be listening to George Soros, who predicted the mortgage crash. Rihanna's father, Ronald Fenty, is upset with the Los Angeles Police Department over the leak of a photo that apparently shows his daughter shortly after her alleged altercation with Chris Brown, according to People.com. "Sloppy work on their part," Fenty reportedly told the magazine. MTV also reports, Fenty also spoke with UsMagazine.com on Friday, describing the photo as "terrible." "Yeah, I saw it," he told the magazine. "It's disturbing." He added that he thought people now will be able to "grasp the situation a lot better. It's good and it's bad to see the picture because there's other people who were thinking differently, that [Rihanna's injuries] may not be that bad, just a little spank or a little thing." The photo appeared online Thursday night, and immediately prompted an internal LAPD investigation into the leak. 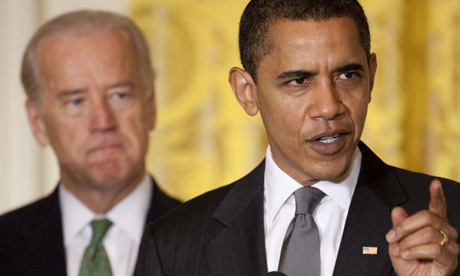 Obama Lectures Mayors: Don't Screw this Up! As reported by The Huffington Post and other news and blogger outlets, President Barack Obama warned many of the nations Mayor's not to screw-up and don't float wasteful ideas. President Obama also warned the mayors he would call them out. The Huffington post reports, that President Obama, sounding, at times, like a school teacher lecturing a classroom of mischievous students, President Barack Obama warned a gathering of mayors on Friday that the stimulus money they received better be spent wisely, transparently and without political motives. AAPP: President Barack Obama may need to coach this nations Governors as well. This would include his own buddy, Gov. Deval Patrick, whom I and many others are wondering if Massachusetts is ready to steal the stimulus money? Of course I don't say this lightly, it has happened before in Massachusetts and Mississippi. Eric Holder showed great character when he addressed his Department of Justice just a few days ago. 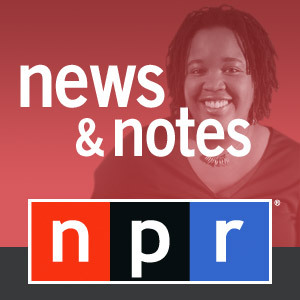 Check out - H/T Wichita NAACP Blog - Pat Buchanan and Dr. Micheal Eric Dyson attempt a courageous conversation on Race. AAPP: Rikyrah is on point. "Holder told the truth during his speech. It was thoughtful, smart, historical, honest and contemplative." There are many others who are on point with their analysis, including Mary Mitchell over at the Chicago Sun Times, who writes: U.S. Attorney General Eric Holder has surely given Loudmouth Limbaugh a hot topic. In a speech Holder gave for the African-American History Month program at the Justice Department, he called Americans "cowards" with respect to race relations. "Though the nation has proudly thought of itself as an ethnic melting pot, in things racial we have always been and continue to be, in too many ways, essentially a nation of cowards," Holder said. "Though race-related issues continue to occupy a significant portion of our political discussion and though there remain many unresolved racial issues in this nation, we average Americans simply do not talk enough with each other about race." Most black people likely agree with that statement, while a lot of white people likely disagree. Holder called on us to "respect one another" and to use Black History Month to "learn more about each other." Before people get hung up on "coward," think about the times you've been misunderstood when it comes to race issues. It is easier to avoid the topic altogether. Holder isn't putting us down. He's asking us to have courage. Link to the Chicago Sun Times. Hat Tip to Ms. Yantin and the folks at MSNBC. Ms. Yatin is great, she provided a powerful link on the black NY Pullman Porters - the largest group of black workers in post-slavery America, who are finally being recognized as the early engine of the civil rights movement. This is a must see clip below, which aired on NBC Nightly News yesterday evening with Brian Williams. Great job MSNBC! As reported in the video, it was era when America traveled by train, one of the best jobs an African-American man could land was working as a Pullman porter. It also was one of the worst. The hours were grueling — 16 hours a day, seven days a week. The first Pullman porters, hired after the Civil War, were former slaves. Their ranks swelled until they reached 20,000 in the early part of the 20th century, making them the largest group of African-American men employed in the country. Last Tuesday, Amtrak honored the legacy of Pullman porters, who fought bigotry to form the first-ever black labor union in the country in 1925, achieving better wages and shorter hours. Little is known about the extraordinary accomplishments of these men, who were the foot soldiers in the early civil rights movement. They ushered in a new generation of leaders like Malcolm X and Thurgood Marshall, both porters themselves. AAPP: This is a powerful and significant piece of history my friends. As noted from the great folks at the A. Phillph Randolph Institute Musuem, during the century spanning the years 1868-1968, the African-American railroad attendant's presence on the train became a tradition within the American scene. By the 1920s, a peak decade for the railroads, 20,224 African-Americans were working as Pullman Porters and train personnel. At that time, this was the largest category of black labor in the United States and Canada. The Pullman Porters organized and founded the Brotherhood of Sleeping Car Porters in 1925. The BSCP was the very first African-American labor union to sign a collective bargaining agreement with a major U.S. corporation. A. Philip Randolph was the determined, dedicated, and articulate president of this union who fought to improve the working conditions and pay for the Pullman Porters. AAPP: As we see Black unemployment soar, and the recession take a heavier toll on our young and older black citizens, I only which, people like A. Philip Randolph and Rev. Leon Sullivan were alive today. I wish we could channel A. Philip Randolph and Dr. Leon Sullivan into a discussion joining in with these great pullman porters to take some time with the Congressional Black Caucus and other colored groups, and coach them on what true leadership is. As reported the the Huffington Post, a cartoon likening the author of the stimulus bill, perhaps President Barack Obama, with a rabid chimpanzee graced the pages of the New York Post on Wednesday. The drawing, from famed cartoonist Sean Delonas, is rife with violent imagery and racial undertones. 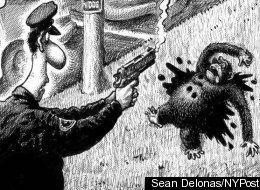 In it, two befuddled-looking police officers holding guns look over the dead and bleeding chimpanzee that attacked a woman in Stamford, Connecticut. "They'll have to find someone else to write the next stimulus bill," reads the caption. AAPP: Oh, not again, more ignorance by the media, but this time they go violent. So... Barack Obama is a Monkey, and he should be, what, New York Post editors? Thank god there are Black voices and many other voices across the blogosphere and afrosphere who are outraged at the offensive New York Post 'Shoot The Monkey' Cartoon. UPDATE: H/T to Casey Gane-McCalla for his recent article/post on the top 10 most offensive New York Post cartoons - More HERE. 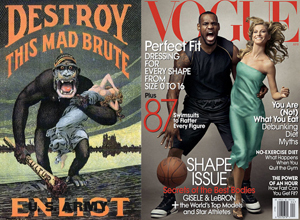 Also H/T to Baratunde over at Jack and Jill Politics for his post on the connection between blacks as apes and police brutality. 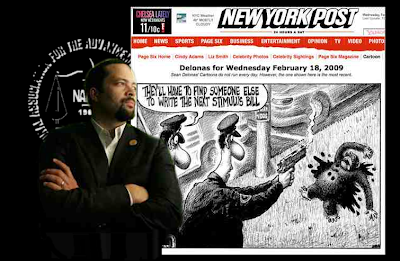 AAPP: Based on these offensive cartoons, I would place the NY Post and Sean Delonas as part of a nation of cowards. Big H/T to Attorney General Eric Holder said Wednesday that despite advances, the United States remains “a nation of cowards” on issues involving race. Here are excerpts from Atty Gen Holder's remarks on race. The bottom line is, the cartoon is color aroused , bigoted and some would call cowardly. Yes, Eric Holder’s speech on race was right on the money, even though some like the American Thinker are ignorant, to the fact. No one, at least in America's Black communities are laughing. The cartoons and the color aroused bigorty and racism is just not funny. The folks at NECN.com in Boston, Massachusetts are reporting how black bloggers are making an impact in political and social action in America. This report is related to the The Bay State Banner report just this week. Check out the comments of the The Bay State Banner Editor, in the broadcast regarding afrospear bloggers, and other black bloggers. Rick Pearson and Janet Hook of The Chicago Tribune provide greater detail to all that is going on. They report that Burris' first description of his contacts with Blagojevich came in a sworn affidavit to the impeachment panel on Jan. 5 in which he attested that other than speaking to one of Blagojevich's lawyers on Dec. 26 about his interest in the Senate seat, "there was not any contact between myself or any of my representatives with Gov. Blagojevich or any of his representatives regarding my appointment to the United States Senate." Three days later, Burris appeared before the impeachment panel to give sworn testimony. He was asked specifically about any contact he had with insiders that included Robert Blagojevich, the former governor's brother, as well as chief of staff John Harris and former aides John Wyma, Lon Monk and Doug Scofield. Burris testified only about a discussion he had with Monk dating back to July. In the recently filed affidavit, however, Burris acknowledged that he spoke with the others, including three times with Blagojevich's brother who was soliciting fundraising help, as well as Ed Smith, a Downstate labor ally of the former governor. Burris said he rejected Rob Blagojevich's request to help the former governor's fundraising. The new affidavit prompted calls by Illinois House Republicans, including Rep. Jim Durkin (R-Western Springs), to convene the Democratic-led House impeachment panel and ask it to refer Burris' affidavits and testimony to the Sangamon County state's attorney, Republican John Schmidt, for investigation over possible perjury. Durkin was the lead Republican on the House panel and questioned Burris about his contacts. According to transcripts of the hearing, Durkin asked Burris if he discussed the Senate vacancy with "any members of the governor's staff or anyone closely related to the governor, including with family members or any lobbyists connected with [Blagojevich]" and then named Harris, Blagojevich, Scofield, Monk and Wyma as well as deputy governor Bob Greenlee. After conferring with his attorney, Burris responded, "I talked to some friends about my desire to be appointed, yes." On Sunday, Burris maintained his "yes" answer applied to every name Durkin asked about except Greenlee. "There's a 'yes' answer in that it means I talked to all of those individuals," he said. Asked why he went on to answer a follow up question by Durkin that only detailed contacting Monk, the senator blamed his Republican questioner who "took us off in a different direction" that didn't allow him to give a complete answer. "Why didn't he come back to those [others] if he was interested in them?" Burris said of Durkin. After Burris' news conference, Durkin said it was "pretty clear what I was asking" at the hearing. "There's nothing from what I heard in the press conference that changes my mind" in seeking a perjury investigation, he said. Burris' attorney said the senator decided to file a new affidavit after reading a copy of the transcript of his testimony at the hearing "to make sure there was nothing left out." Burris said on Sunday that the initial affidavit was in response to the panel's interest in how he obtained the appointment and that the most recently filed affidavit "dealt with contacts I had about the Senate seat. Look at the difference." Illinois Republican House members weren't the only ones voicing concern. Rep. Susanna Mendoza (D-Chicago), an alternate member of the impeachment panel, said she did not believe Burris had been "forthright and honest" in his answers to the committee in light of his newly filed affidavit and said she would support an investigation of the new senator. AAPP: Now the question is should Burris resign? Well, I'm with Mark Brown at another great Chicago newspaper the Chicago Sun Times, who writes, "I'll leave it to the proper investigative bodies to decide whether Roland Burris committed perjury last month in testimony before the Illinois House impeachment committee." Is Woody Allen a color aroused bigot? Although Woody Allen's latest film, Vicky Cristina Barcelona, has been seen by the critics as a welcome return to form for the director and won its star Penélope Cruz a Bafta award, Angela Bassett, the acclaimed black actress, has her reservations about its cultural authenticity. "I mean, to have one black cast member for the whole film seems rather strange, and, oh yes, she's a prostitute, of course," said the actress who portrayed Tina Turner in the biopic What's Love Got to Do With it? "Don't get me wrong, I love Spain and it looked beautiful, but that part of the world is so diverse and, really, what is that about?" Although Allen has succeeded in signing up Sir Anthony Hopkins and Josh Brolin to appear in his next film, which is set in London, the 50-year-old American actress added that she had herself no desire to work for him. "I wouldn't want to," she told Mandrake at the premiere of Notorious, a film about the late rap singer the Notorious B.I.G. "He's a little weird." Miss Bassett is not the first person to point out the prevalence of white faces in Allen's films. When Spike Lee, the black director, was criticised for allegedly not featuring many white characters in his films, he was quick to point out that Allen had very few blacks in his. AAPP: OK, he is a color aroused, bigot and child _____ (you fill in the blanks). Is Massachusetts Ready To Steal The Stimulus Money? AAPP: In my home town, of Boston, Massachusetts, the crooks and liars are ready to steal the stimulus money. As reported by The Boston Globe, The real estate developer chosen by Governor Deval Patrick to distribute billions of dollars in federal stimulus money has been receiving a state pension ever since he was fired from his job at a state development agency in 1995, according to state records. Note: Let's include northern Mississippi in the equation, Massachusetts.